Smoke billowed throughout the tent and left the area a-glow in orange. The flames lapped up from beneath the metal spherical disk. She pounded the dough into a flat pizza like form and simultaneously stoked the fire with more wood with her free hand. The spherical metal ‘griddle’ was just the right temperature…thwak! The flattened dough landed on the griddle and immediately went from dough to solid form, bubbling from the intense heat. Kids covered in dust stared at me until I gave them a glance and then they turned and ran the other way or tried to hide behind anything to escape my eyes. It felt as if I was in an undiscovered land or had moved backwards through time; and in a way – I was. 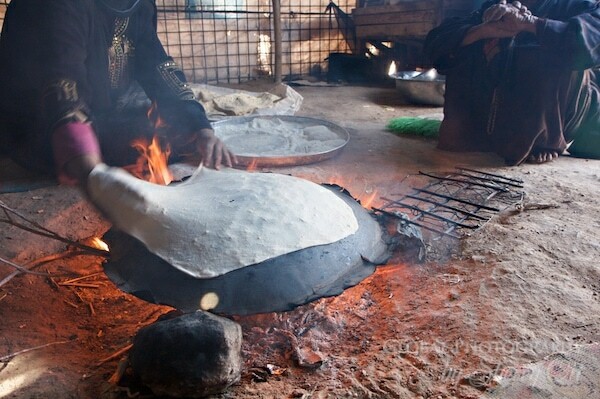 I was lucky enough to get invited into the Bedouin woman’s tent to watch this process. The woman who’s face I could not photograph was making shrak, a Jordanian bread which is used at every meal at Feynan to scoop up food and make sandwiches. The sandwiches weren’t for locals, it was for tourists who were staying at the Ecolodge nearby. The Feynan Ecolodge integrated into its Bedouin environment so as to practically go unnoticed; however a few lucky tourists have discovered its charm.